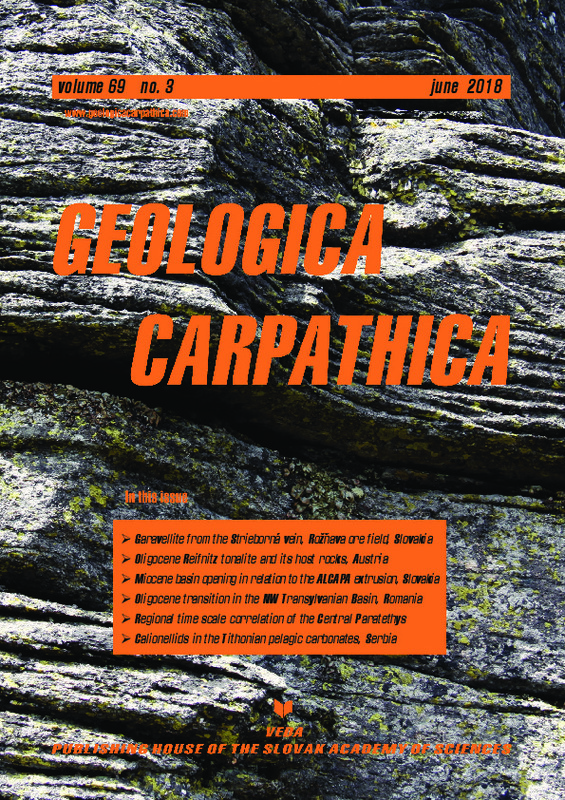 Abstract: The article presents the first description of a complete and continuous series from berthierite to garavellite sulphosalts in the Western Carpathians. Berthierite is a common main or accessory phase of Sb mineralizations in the Western Carpathians, and occurs at many localities and ore deposits as well. On the other side, garavellite or Bi-rich berthierite is a relatively rare accessory phase. The highest Bi content in garavellite reaches up to 38.04 wt. % which represents 0.90 apfu, and its crystallochemical formula can be written as Fe0.97Sb1.07Bi0.90S3.98. Raman band shifts were observed in the isomorphic berthierite–garavellite series. Garavellite occurs in the younger stages of sulphidic mineralization, and associates with tetrahedrite, berthierite, Bi-chalcostibite, Sb-bismuthinite, Bi-stibnite, ullmanite and cinnabarite. It creates irregular grains and veinlets in pre-existing tetrahedrite, or forms myrmekite intergrowths with chalcopyrite in tetrahedrite. Bi content in chalcostibite is up to 0.20 apfu. Besides the tetrahedrite, pre-existing sulphosalts are the members of the tintinaite–kobellite series, Bi-jamesonite and bournonite. The Sb/(Sb+Bi) ratio of minerals of the tintinaite–kobellite series varies from 0.37 to 0.80. The maximum content of Bi in jamesonite is up to 1.22 apfu. A vertical zonation at the ore vein body (mining levels 6 / 180 a.s.l., 8 / 80 a.s.l., 10 / 20 b.s.l.) is represented by the Sb decrease along with the Bi increase with increasing depth. Bi content continuously decreases during the older ore mineralization stage and Sb increases at the younger mineralization stage. Both of the stages have been enriched by Sb as well.